The Romanian-American University is a higher education institution, a legal person of private law and public utility, part of the national system of education, founded in 1991, accredited by law in 2002, receiving the qualification "High confidence rating" from ARACIS in 2010, whose mission is to offer high quality education and research, in an intellectually stimulating environment both for students and for the teaching staff. The Romanian-American University was founded in1991 whose mission is to promote the educational values of the American academic education given the rich traditions of the Romanian education. The initiative of the establishment of the Romanian-American University belonged to the late Prof. Ion Smedescu, Ph.D., founder of the Romanian-American University and president of the Romanian-American Foundation for the Promotion of Education and Culture. 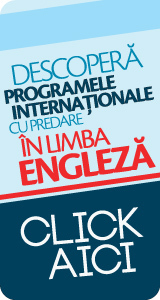 The Romanian-American University is an independent institution without being affiliated or sponsored by American University. For the accomplishment of this objective, the starting point was the in the United States of America, the academic education is supported by the general model of behavior of the American society, based on the efficient organization of activity, tenacious sense of duty, cultivation of labor, self-respect and respect for others, fair competition throughout one's entire life, competition with the others and, mostly, with oneself. March 11, 1991 - The Assembly of the establishment of the Romanian-American University when its Statute was approved and which stipulated the establishment of 7 schools: School of Domestic and International Business, Banking and Finance, Management, Hotel and Tourism Economy, Computer Science, Medicine and Public Health, Law, Engineering in design and product aesthetics. March 28, 1991 - the Decision no. 364 of the Ministry of Education and Science approved the establishment of the Romanian-American University. April 17, 1991 - the Ruling no. 295/17.04.1991 of the Court of Law of 1st Sector, Bucharest, "as per art 32 of the Decree no. 31/1954 and art 84 and the following of the Law 21/1924" granted legal personality to the Romanian-American University, headquartered in 35-37 Sos. Oltenitei, 4th sector. June 10, 1991 - the assembly for the establishment of the Romanian-American University's Senate where the late Prof. Ion Smedescu, Ph.D., was elected, with a majority of votes, Rector and was appointed "Founding Rector of the Romanian-American University". Moreover, the first management positions were elected according to the law (vice-rectors, Senate scientific secretary, executive managers, deans) and the curricula, enrolment figures, tuition taxes as per education forms and the enrolment fees for the admission were also approved. July 1991 - the organization of the first admission exam following which 1772 students were admitted. December 11, 1991 - the end of 1991 witnessed the enactment and vote of the Constitution of Romania, by means of each private education was legally recognized as part of the national system of education. Under these new provisions, at the initiative of the late Prof. Ion Smedescu, Ph.D., on December 11, 1991, the "Romanian-American Foundation for Promoting Education and Culture" (FRAPEC) was established. The formal recognition of FRAPEC came by the Ruling no.34/22.01.1992 of the Court of Law of 1st Sector, Bucharest. The goal of FRAPEC was "the promotion and dissemination of Romanian cultural and civic education values in America and of American values in Romania". Among the 27 founding members of FRAPEC there were prestigious university professors, researchers, lawyers, economists, medical doctors etc. The foundation has taken under its auspices the Romanian-American University, in order to abide the law in place and has elected the late Prof. Ion Smedescu, the RAU Rector, as President. 1992 - 1993 - Years of quality and quantity accumulation for the University. In February 1992, the University's Center of Scientific Research was established and in May 1992 the first session of student scientific research was organized, which has become a tradition in our University. 1994 - 1995 - the process of temporary authorization, as per the provisions of the Law no. 88/1993 on the accreditation of high education institutions and the acknowledgement of diplomas and as per the Law no. 84/1995 - the law on education. 1996 - 2002 - the process of the University's accreditation, according to the legal provisions in force, critical stage for the legal establishment. 2000 - the School of European Economic Integration Studies was established, temporary authorized by the G.D. no. 1215/2000. 2002 - 2003 - The period of institutional surveillance, as per the provisions of OMEC no. 4548/2002. September 2002 - the first exam at the completion of the bachelor studies in the Romanian-American University, according to the law. October 2002 - the Ministry of Education and Research approved the organization and development of master programs (post-academic studies with duration of 3 semesters according to the law). October 2003 - the inauguration of the Romanian-American University's Campus with the attendance of representatives of the country's leadership and of the partner American universities. June 2003 - the commencement of the process for the authorization of the part time study programs at the School of Domestic and International Business, Banking and Finance, Management-Marketing, Domestic and International Tourism Economy and Law according to the law. As per G.D. 1069/October 2004, the University obtained the temporary functioning permit for part time studies. June 2004 - A new legal provision (Law no. 288/2004 on the organization of academic studies) led to a major reform of the Romanian academic education's structure. The law was enforced starting with the academic year 2005-2006 and concerned the Bologna reform and the transfer to the organization of academic studies per 3 cycles: bachelor-master-doctorate. Institutional re-accreditation 2007 - 2010 - the Bologna reform (2005-2008), required by the enforcement of the provisions of Law no. 288/2004 and other legal requirements, led to the reorganization of the education offer of the Romanian-American University compared to the existing study areas, related majors and the number of distributed credits. With the enactment of the Government Emergency Ordinance no. 75/2005 on the assurance of the education quality, passed under Law no. 87/2006, the process of institutional re-accreditation was triggered (and, thus, of each study program), on the one hand and, on the other hand, the process for the design and implementation of the Quality Management System. Equally, new master programs were launched, designed in line with the bachelor programs and accredited by ARACIS, as per G.D. 404/2006. For the first bachelor graduates from the Bologna system (July 2008), the University offered 10 master programs (Bologna) accredited according to the law. 2007 - 2008 - the 4 schools in the economic area became members of the Association of the Economic Schools from Romania (AFER), renowned professional-scientific body including the most valuable public economic institutions from Romania. July 2010 - the institutional evaluation and the award, on July 22, 2010, by the ARACIS Board, in unanimity of votes, of the grade "High degree of trust", the highest national qualification as regards the quality of educational services rendered by an academic education institution, according to the law. 2010 - 2011 - Diversification of the educational offer and the accreditation of two new programs of bachelor studies, exclusively taught in English for the majors "International Business" (School of Domestic and International Business, Banking and Finance) and "Computer science for economics" (School of Computer Science for Business Management). 2011 - The process of evaluation for the classification of the university and ranking of the study programs, as per the provisions of the G.D. 789/2011 on the approval of the Methodology of the evaluation for the classification of universities and ranking of the study programs and as per other legal documents (OMECTS 4072/2011, OMECTS 4174/2011 and OMECTS 5204/2011). According to the provisions of OMECTS 5262/2011 on the acknowledgement of the results on the classification of universities, the Romanian-American University is an education focused university.